Joe Sanchez, 79, a resident of Pojoaque, formerly of Santa Fe, passed away suddenly on April 6, 2018 at his home. Joe was born June 9, 1938 in Youngsville, NM. As a young child his family moved to Santa Fe and settled in the neighborhood he called home for over 75 years. In 1955 at the young age of 17, Joe enlisted in the United States Navy. He earned his high school diploma as he proudly served his country. His time in the service was very meaningful to him and he often shared his many memories. After being honorably discharged Joe returned to Santa Fe and began working to help support his family spending the majority of his career working at the New Mexico State Penitentiary until his retirement in 1992. In 1972 Joe married the love of his life, Pita, with whom he spent 42 years until her passing in 2014. During their marriage they raised their 2 children; Karen and Joey; and were very involved in the care of their grandchildren and great-grandchildren. Joe was an avid sports fan. He spent many hours watching, playing and generally enjoying sports. He was a wonderful host for family “pool tournaments”, Super Bowl and pay-per-view “fight nights”. He loved his family and was never too busy to show his support. Throughout the years his family could always count on seeing him in the stands; the audience; in the classroom; at the family function; or enjoying the afternoon on the porch. His absence will be felt in the hearts of many and his family will miss him greatly. 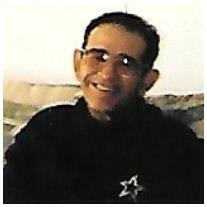 Joe was preceded in death by his beloved wife Pita and son Joseph “Joey” Sanchez; great-grandchildren Isaac and Gabriella Mortera; parents Aquilino and Dolores Sanchez; In-laws Elizario and Estefanita Garcia; siblings Mary Alice Vigil and Bernard Sanchez; and many brothers and sisters–in-law, nephews and cousins. He is survived by his daughter Karen and husband Fred Vigil; grandchildren Stephanie and husband Lou Mortera, Matthew Vigil and fiancé Patricia Chavez, Thomas Vigil and wife Sara; great-grandchildren Joseph and Abrianna Mortera; siblings Phil Sanchez, Gilbert Sanchez (Lourdes), J.A. Sanchez (Maida), Wilfred Sanchez (Bessie), Larry Sanchez (Stella), Cecilia O’Neil, Cleo Holt (Harold), Geraldine Sanchez, Theresa Louton (Michael); brothers and sisters-in-law Gloria Montoya, Elizario Garcia Jr. (Emily), Ray Garcia (Marvine), Flora Martinez (Ross), Annabelle Brazeal (Ron), Robert Garcia (Lucy), Joe Garcia (Debbie), Ben Garcia (Charlotte), Dorothy Garcia and Orlando Vigil; and many cousins, nieces and nephews who he cherished. Serving as pallbearers are: Robert Garcia, Jeffrey Vigil, Larry Sanchez, Steven Vigil, Lou Mortera, Fred, Matthew and Thomas Vigil. Honorary pallbearers: Joseph and Abrianna Mortera; Phil, Gilbert, J.A. and Wilfred Sanchez; Annette Alire, Jennifer Saavedra; David, Michael and Deniece Sanchez; Angelina, Brittney and Matthew Garcia. Visitation will be held beginning at 6:00 p.m. on Thursday, April 12th at Our Lady of Guadalupe Church in Pojoaque where a rosary will be recited at 7:00 p.m. Mass of Christian Burial will be celebrated at 10:00 a.m. on Friday, April 13th also at Our Lady of Guadalupe Church in Pojoaque. Interment services will follow at the Pojoaque Cemetery.